The Tower of Termes, classified historic building, is the only vestige which remains castle of Thibault de Termes, companion of Jeanne d' Arc. Thermal baths are an exceptional example of room with turn gersoise, by its dimensions and the quality of its residential, quite separate program between the building-room sheltering public spaces, and the tower sheltering the vault and the rooms, remarkably many. 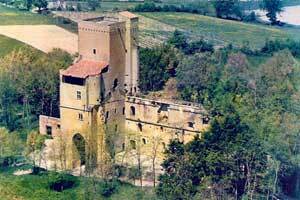 Travel in the History and the traditions with the Museum of the Gascon Plume! The rooms of the tower present historical reconstitutions with wired for sound comments. You will be able to also attend many medieval animations all the summer. Casteland.com particularly thanks association "the FRIENDS FOR the MUSEE OF the GASCON PLUME" for the photographs (Frederic Augé) as well as the information on the castle.